When I was five, my career ambition was to be a cake decorator. Making paintings you could eat, what could be better? As it turns out, I became a storyteller. I hope my five-year-old self is okay with this change in course. I read a lot when I was a kid. I also performed at the Minneapolis Children’s Theatre Company. I was in Alice in Wonderland, Madeline’s Rescue, Babar, Pippi Longstocking, Pinocchio, The 500 Hats of Bartholomew Cubbins, A Wrinkle in Time and other plays. To balance out these enriching educational experiences, I also watched a lot of TV. For a while, my favorite show was called Small Wonder, about a little girl robot named Vicki who could lift a car over her head. Spending so much time immersed in stories as a kid did something to me, like in Batman, when that guy falls in a vat of chemical green goo and becomes the Joker. But instead of becoming a supervillain with diabolical plans, I became a storyteller determined to write and draw. Me and the Joker both like to laugh, though. I’ve written two middle-grade novels, Elvis & Olive and Elvis & Olive: Super Detectives. I also wrote the picture books Behold! A Baby and The Wee Hours. There’s a new novel and a couple of picture books in the works, and I am branching out into visual storytelling, too (check out my comics). A proud product of the Minneapolis Public Schools (Clara Barton Open, South High), I also attended Sarah Lawrence College in New York. I’ve been lucky to receive grants from the Minnesota State Arts Board and the Jerome Foundation. 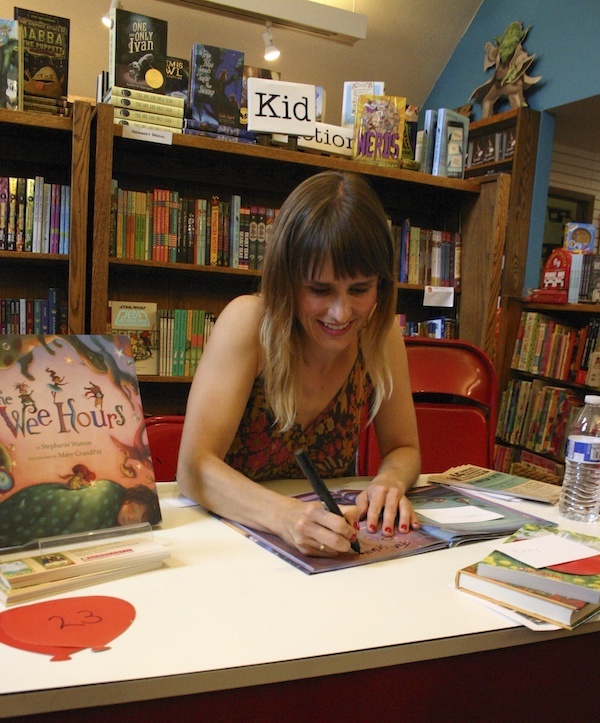 In addition to writing stories, I also teach writing workshops for children and adults. And I am the mother of a rainbow tornado of joy named Ivy. We live in Minneapolis, Minnesota.